The woad has been thriving in this time of rain followed by warmth. (The potatoes aren’t doing badly either, as you can see). And that can only mean one thing, when free time opens up! 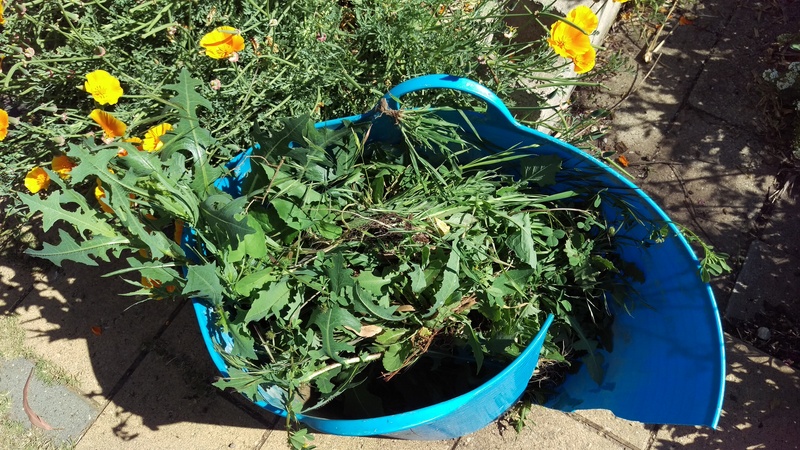 I managed to obtain Jill Goodman’s A Dyer’s Manual recently, and had the benefit of others helping me to grasp the chemistry of fresh woad and how it differs from using indigo that has already been prepared from fresh plants by someone else. I came by the book at the annual spinner’s retreat where there were folk with interest and knowledge–perfect, and very helpful indeed. So this time I felt I knew why I was adding air in the early stages of the process, only to then remove it in the de-oygenation process required to have the dye become fully soluble and able to attach to fibres. Previously this has been a total mystery or had me feeling I had done something wrong, or both. I still had part of one package of hydrosulphite left. I am pretty keen to have it be the last. Hydrosulphite is a substance the earth could do without. But equally, since I have it, better to use it rather than let it become stale and unusable for this process. So I tried two vats: one with hydrosulphite and one with fructose. The picture above is grey merino fleece descending through the ‘flower’ on the surface of the hydrosulphite vat and into the yellowy depths below. This image is the fructose vat, which involved some guesswork on my part (no way to measure how much woad pigment there was in my solution). I am not experienced enough to have great judgment or to trust my own judgement. I can measure temperature and I can measure Ph. The complex part is judging the reduction (de-oxygenation) of the vat. This looked very promising to me! That said, there were moments when I had realisations that gave me pause. Jill Goodman, for example, seems to live in England and I suspect her conditions and mine are not the same. She goes from scalding leaves with boiling water through various processes to heating the vat to raise it to 50C (there was a lot of conversion to metric involved for me)… I did the processes concerned and still had a vat at 70C and decided in the end to put the vat in a sink of cold water and ice! This linen scarf did the amazing woad magic of going from yellow to green to blue when put out into the air. 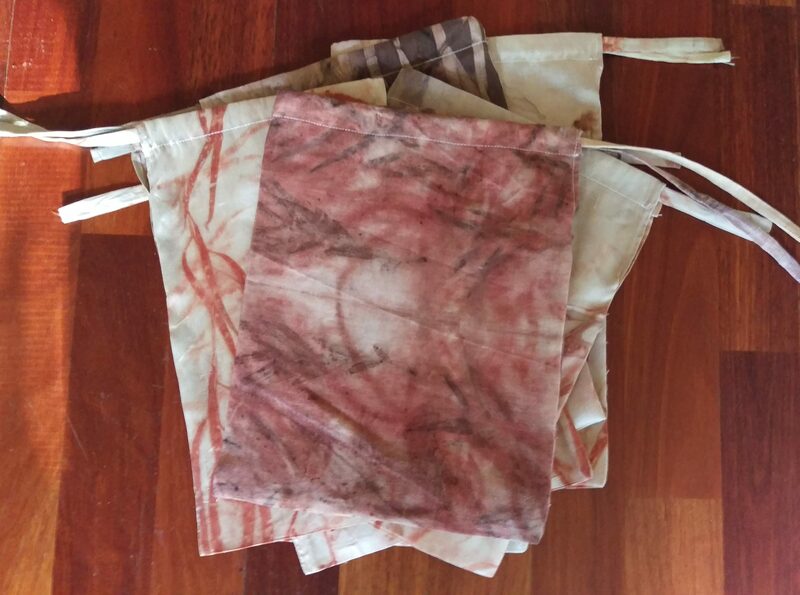 Both of my tied textiles dyed only on the outside and therefore were re-tied and re-dipped. The greeny-blue of the image above converted to blue very quickly on rinsing (you can see an image further down). 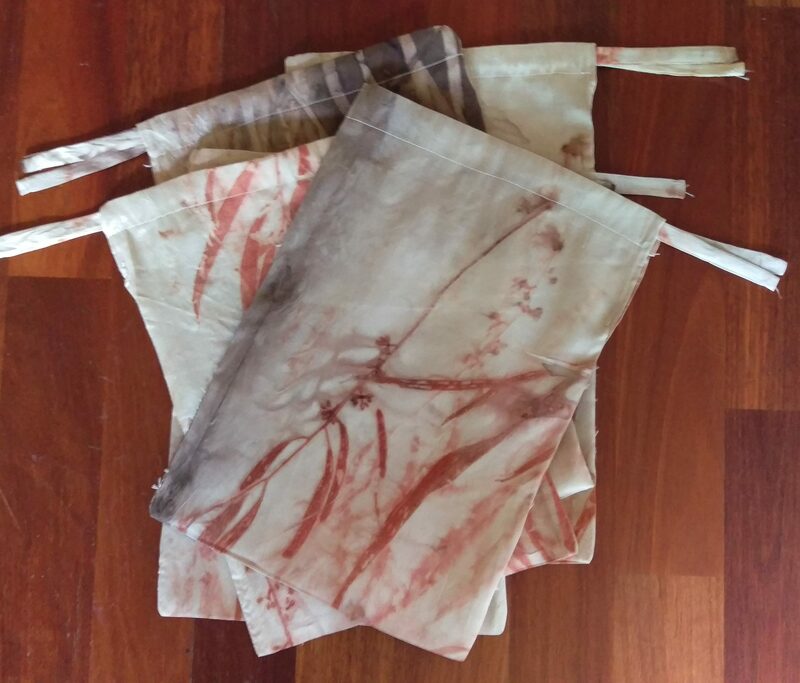 Soon I had dyed my planned fabrics and imagined that the vat would be exhausted, because previous vats have yielded so little. The next day it was clear that the hydros vat was not exhausted, so I adjusted Ph and temperature and set about continuing to dye. The fructose vat was still not reduced, so far as I could tell with a test dip, though again it looked promising and eventually looked much like the hydros vat. However, it still had not reduced, and thus, was unable to dye. In the late afternoon I decided it probably didn’t have any dye in it. Do not read on if you have a weak constitution–but one of the reasons for my belief was that I had accidentally boiled the fructose vat early in the process. Eeek! I had a very little hydros left, so added some to the fructose vat. Then half an hour later, a little more. 30 minutes later, it came into order and began to dye, and I dyed using both vats until bed time using the only clean fleece I seem to have. 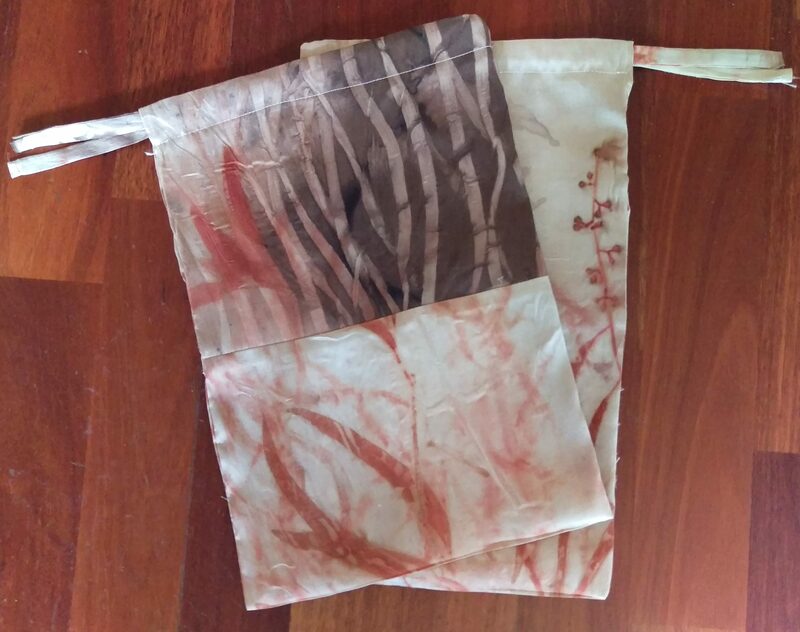 The fructose-hydros vat dyed over two more days, as it turned out! I threw in more cloth and went to bed, feeling extremely pleased. On the down side, I used hydros. On the up side, it can only have been a matter of time before that fructose vat would have reduced. I just needed to hold my nerve and be patient. Maybe add more fructose. Admittedly, time is one of my biggest issues because I do have a day job and other commitments. However, this is by far the most successful woad effort to date. 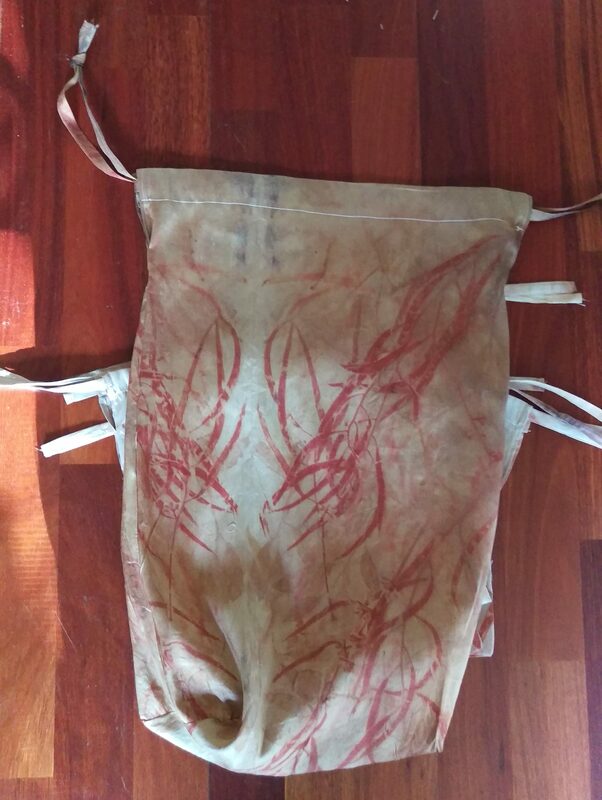 I now understand that I need to use a vat rather than direct dyeing for the woad to be wash-fast. I think I now have a sense of how to tell whether there is dye in the vat (at all) as I process the solution. The low concentrations of colour claimed for woad are not so low as to make it useless, and I have quite a bit of leaf. One vat with 1.6 kg leaves and one with 900g leaves from one part of the garden where other things have struggled to grow well–and this is my second harvest from them. I also have the happy sense that my understanding is sufficient to reach success with a fermentation/fructose vat given time. The pigment from my previous crop of woad is in a different vat which has not shown promise even though I have been waiting for weeks. But it still may! And I am confident now that reduction is the main issue and not one of the other possibilities. Very encouraging mellow blues–and more pictures to come when everything is clean and dry. As the weather begins to really start to warm, I am increasingly keen to get plants into the ground if I can. 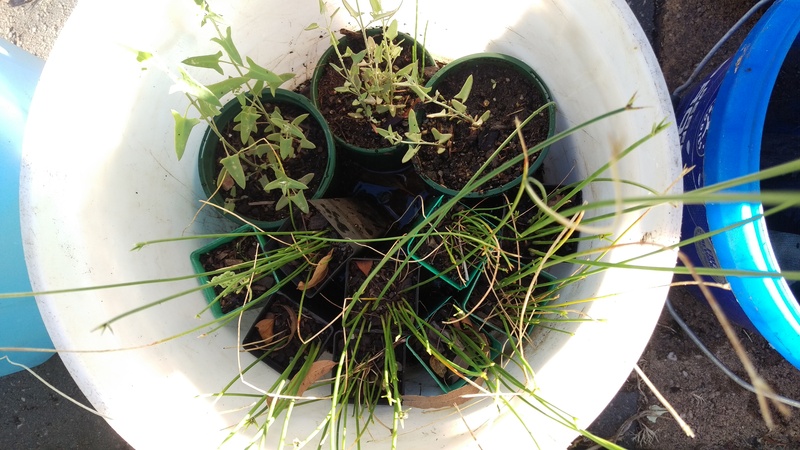 I still have weaving rushes (sedges) that need happy homes. There tubestock pots have become less and less happy. 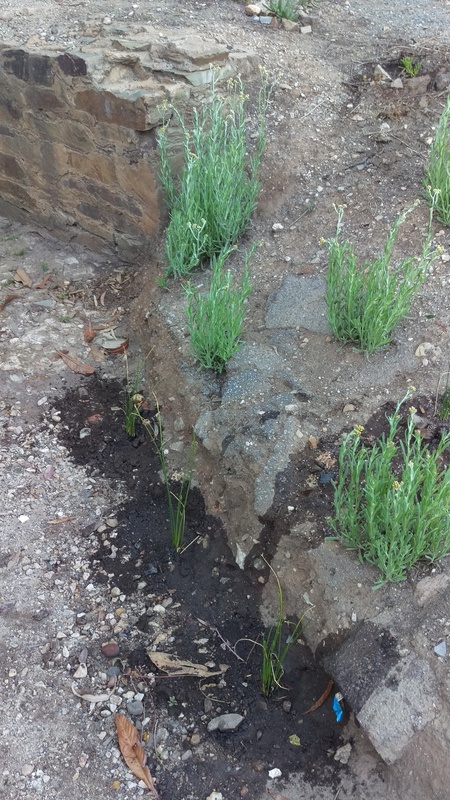 Careful observation makes me think the place where they might have enough soil moisture to make it through the summer is in the culvert I have begun planting out. I added them to edge of the channel, where there is some clay that is still quite wet. Those further up the bank were planted a few weeks ago and have grown quite visibly. I spent some time trying to increase the water holding shaping of the bank, as you can see water just runs down it despite my efforts. Here is the other side of the bank, complete with mystery plants. 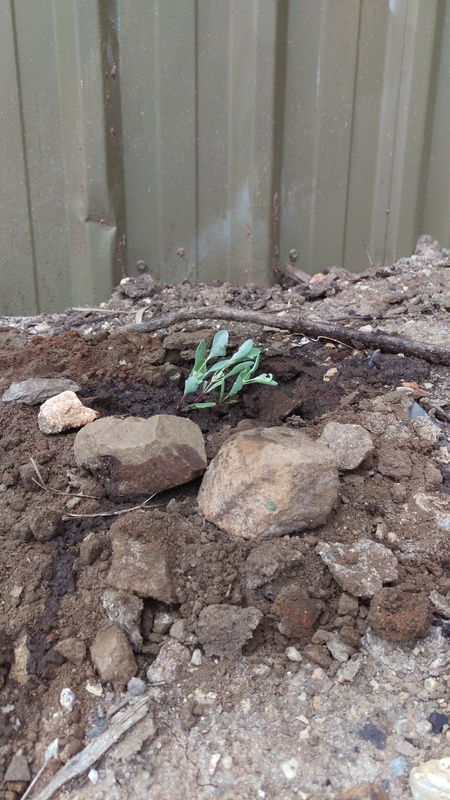 I also planted this scrambling saltbush. 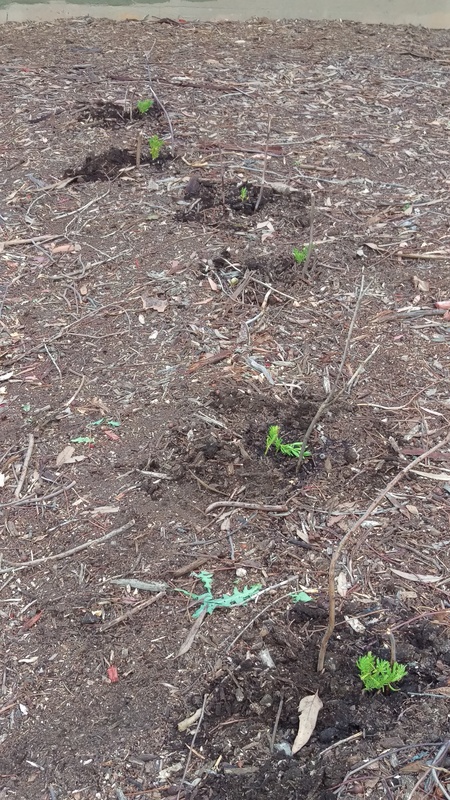 One of them had a stray sheoak seedling in with it. Fingers crossed! A few boobialla up on the top of the banks. And here is the bigger picture. You can barely see my plantings, just the mystery plants, about 30-40 cm high. 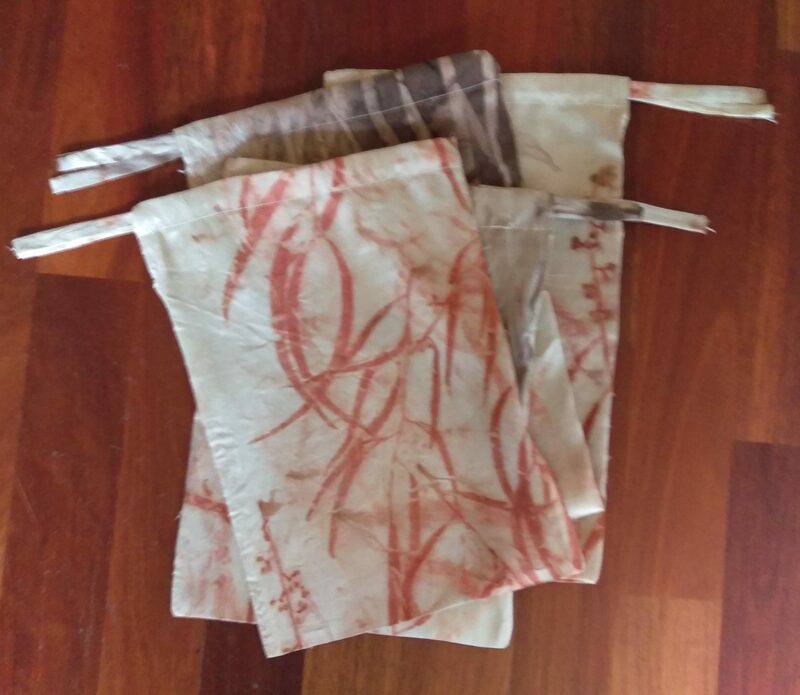 Some time ago I dyed some silk I found at the Guild trading table. Just recently though, I stopped looking at it, draped around the place, and realised what it could become. I am hoping these little bags will be pleasing gifts, and in some cases, replace wrapping paper in the coming season of compulsory gifting, which I prefer to involve as little waste as possible, as I have not managed to convert my family to thinking perhaps this is not the best possible way to show our affection for one another. I love giving people gifts, but I find the compulsory nature of it and the set date, just leads to waste, and giving and getting things that are not always wanted or needed. You knew where this was going, didn’t you? I couldn’t possibly stop at one or two. I think it is partly the satisfaction of figuring something out and routinising it. Practising it. Being able to create a little system. This wouldn’t satisfy every mind, but evidently there is something in it for me. I think it is also as simple as getting on a roll and being able to make maximum use of a piece of fabric. Again, not something that has an inherent logic that would work for everyone. And clearly the attitude of a person who has an outward bound stash rather than just one precious piece of fabric. 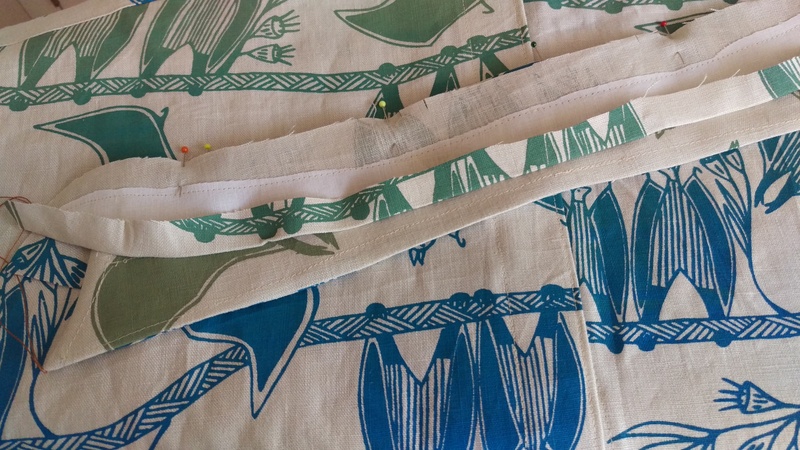 I enjoyed piecing together some of the fabric so I could use it all, as you can see. Yesterday I was out and about before work in the cool morning after some rain during the night. 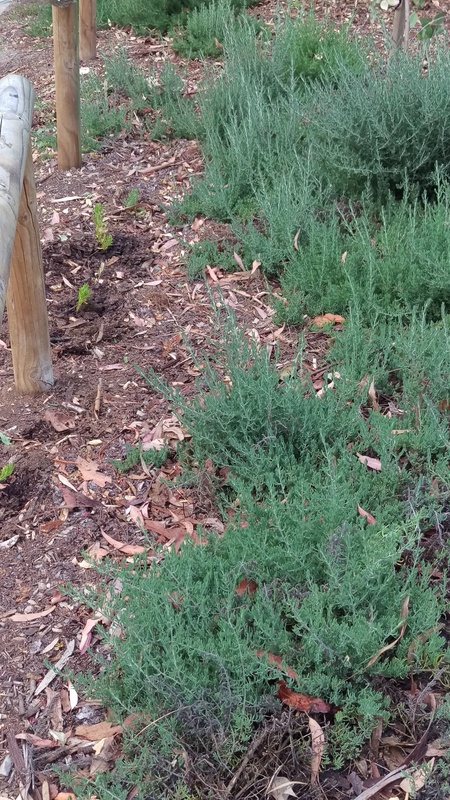 In one spot, I added some tiny saltbush to continue closing the gap between established plants and a pathway. On the other side of the path, the same process. I gave these some little sticks in honour of the neighbour who lives nearest. He approves of the planting and thinks sticks help. I am never entirely sure–sometimes they just attract unwanted attention. A tree was felled here just recently and the predecessors of these boobiallas were taken out in the hubbub. 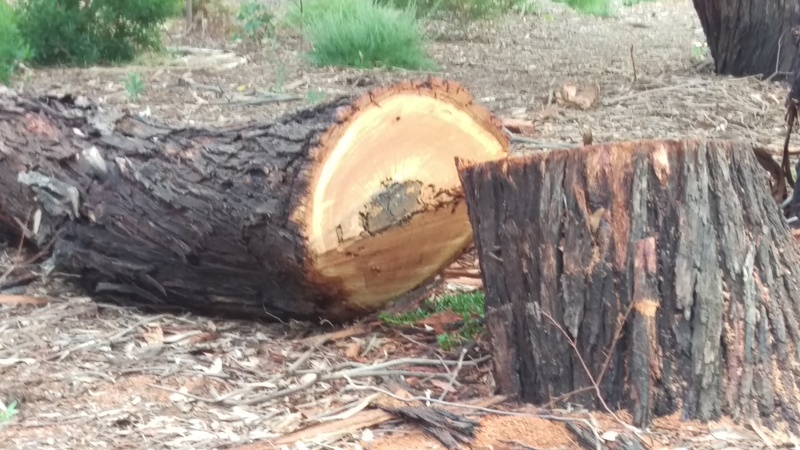 I have been unsure how long to wait to discover whether the trunk of this massive ironbark will be collected. While the canopy of the tree was taken away after it was felled (over two days)… the trunk is lying there and has been for some time now. The longer I leave it, the smaller the chance of preventing parking on this area will become for the year ahead. meanwhile the truck is stopping bike and foot traffic through this patch, which creates an opportunity for plants to grow undisturbed. The tree had died, and since heavy machinery was parked on its root zone right up to the trunk for two years, I have to say parking might be part of what killed this tree and the one that used to stand beside it. 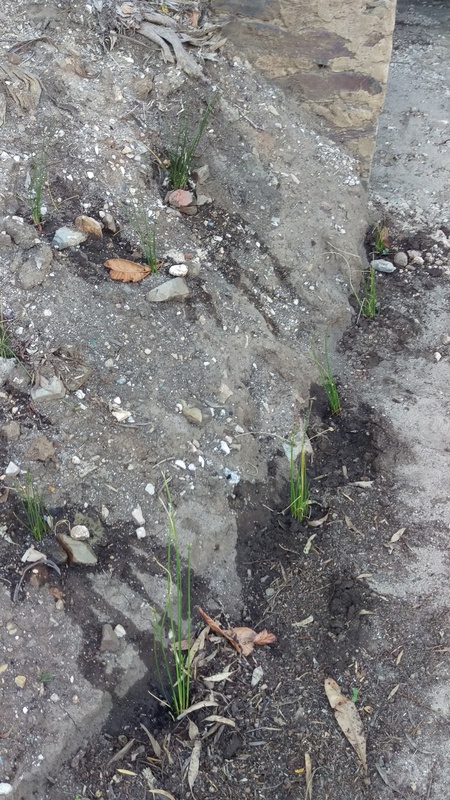 Perhaps I am wrong–but this made me more inclined to plant and try to fend off more soil compaction here. A few more ground covers facing the road where some were lost in the flood. In case you might think there is no progress, look at the size of these ruby saltbush planted in the last year, on the same site. Then, some weeding. 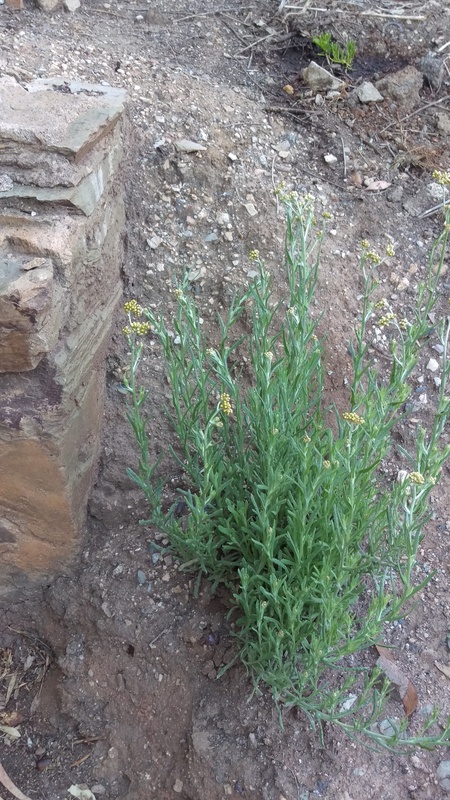 The last thing I want is for the poisoner to take out these little plants unawares while poisoning the weeds. 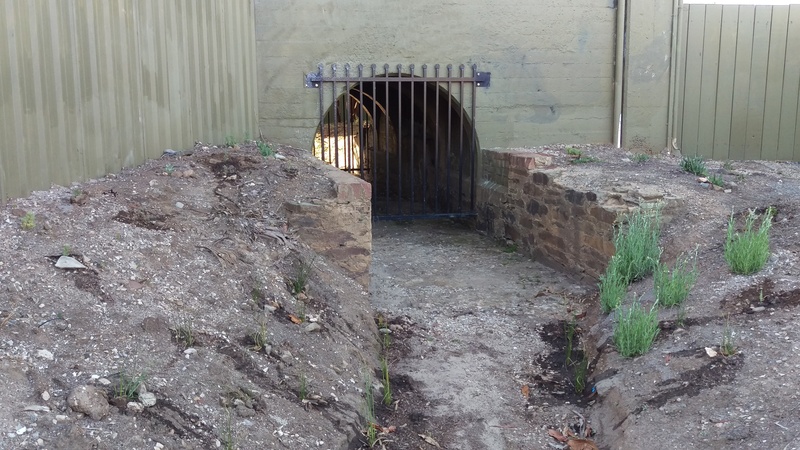 Then I went round to the new site by the culvert and weeded there. The unidentified plant is doing well and flowering. It is not curry plant. That really is what my parents have in their front garden, and there are similarities. But the smell is really distinctive, and missing here. All clues accepted, dear readers! 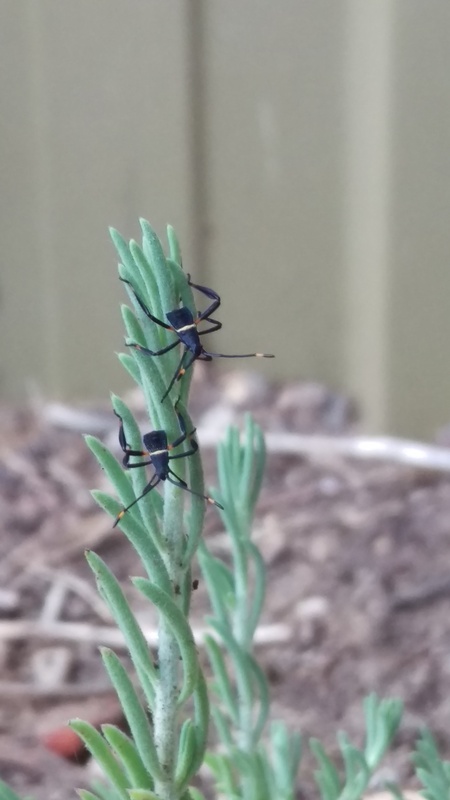 On one small saltbush, I found these little critters. I hope they won’t take too much… I was rather charmed to find signs of life in this unpromising spot, personally. And then home again with weeds galore. We went for a birthday holiday on a house boat on the Mighty Murray River. I’ve never been on a house boat before and it was pretty funny to be in something with six bedrooms, but on the water! We set out on a sunny day and it was just lovely. And then, hours before sunset, the sky turned dark. The river was anything but calm. My capable companions decided it was time to find a mooring, and that the green tinge in the distant clouds was a sign of hail even though it is November. And we moored just in time for powerful winds, amazing rain… the whole thing. Eventually things calmed down and for those feeling nauseous, that part subsided, and the sun set over beautiful river red gums. 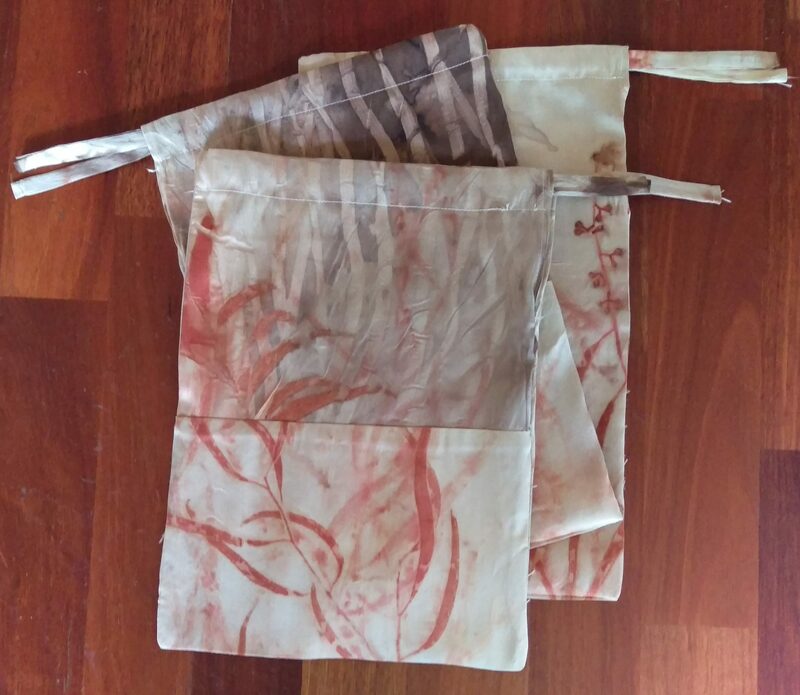 Last week I finally stitched these two little eucalyptus dyed needle books together with madder-dyed thread and they were in my sewing tin along with everything else, so they found new homes among my companions. Here they sit on the obligatory holiday puzzle. It wasn’t all wild weather… there were naps and songs and stories and birthday cake and lots of delicious food and company, and beautiful views. There were so many birds… cormorants, pelicans, ducks and ducklings, superb blue wrens, raptors of various kinds… fabulous! On our return we discovered that every single car (and a lot of houseboats) had been hit by hail the size of golf balls. In November. We’d had a summary phoned in on our first night out, but it was quite a sight in person. After a safety check, we drove home slowly, with the light dancing off all the cracks from 17 major hits on the windscreen. Too many dents in the car to count! Just as well there were needle books to keep things a little bit sensible in between times. A person needs evidence of the ordinary in these challenging times. First there was a walk home from a distant railway station. Cotinus (smoke bush) growing through a fence…. Then there was a walk home from a bus stop on a major road further from home than the one I usually use. And the amazing discovery of a HUGE maple with finely ferny leaves. Hanging over a high fence. Some of the maple leaves came out pale. This one is destined to become a birthday gift. This morning there was a little outing. Planting at a culvert beside the local train station with cyclists whizzing past and runners raising eyebrows. It’s interesting working so close to the train line. I moved into this neighbourhood because of the public transport, and the lucky find of a place we could afford, discovered when I took a wrong turn on my bike coming home from work. The place was for private sale with a handmade sign and we had given up on finding anything in this spot. I appreciate the public transport, and rail freight too, a great deal. But some days I also reflect on the spectacularly ugly way we do these things here. I live in hope that the future will find better ways and that these trains will be powered more sustainably soon. I put in more weaving rushes on the banks of the channel, and some saltbush above it. There was a whole purple towel just inside the fence for the railway, but well past the end of the path. Curious. It can join the dyeing towels. And then there was weeding. The best way to keep the poisoners at bay! 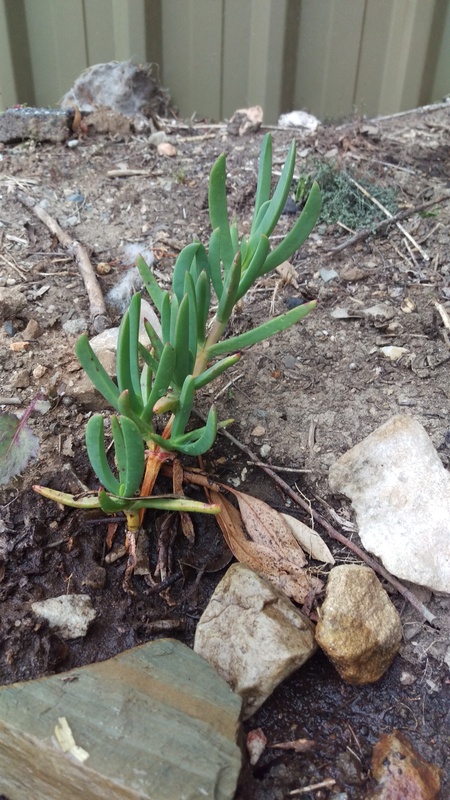 Several of these plants have come up. This one is in bud. Does anyone more knowledgeable know what they are? I think my parents have them in their garden, where I think they give off a curry (fenugreek, perhaps) kind of scent in midsummer. 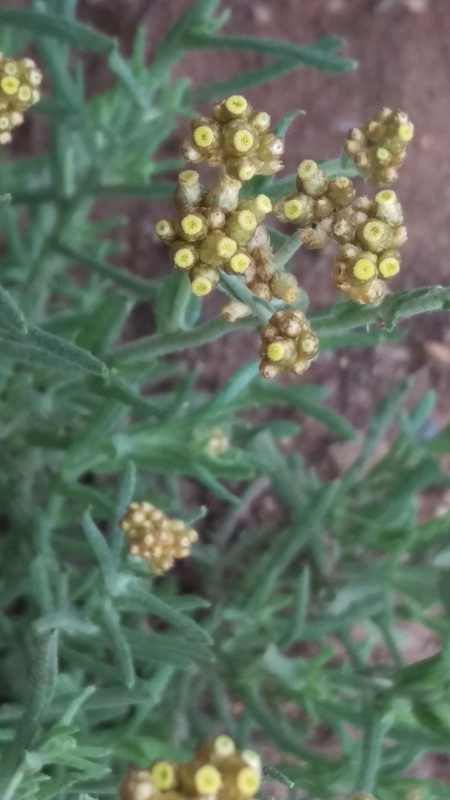 Wandering about on the interwebs, Mum and Dad probably have Curry Plant (Helichrysum italicum) and … this may not be the same plant, but I can’t readily identify it as [locally] native or a weed. Identification is a work in progress. Maybe the recent flooding rains have borne seeds here, as I have seen it nowhere else nearby. 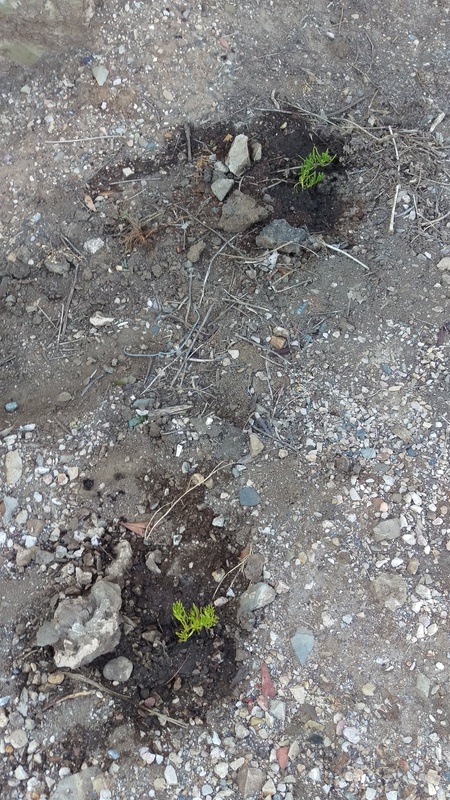 The plant growing in this reveg site I am working on also comes up in the older graves on the West Tce cemetery, where they have recently been poisoned along with the sow thistles. Poison, even in cemeteries. Friends, let me push up weeds if needs be, when the time comes. 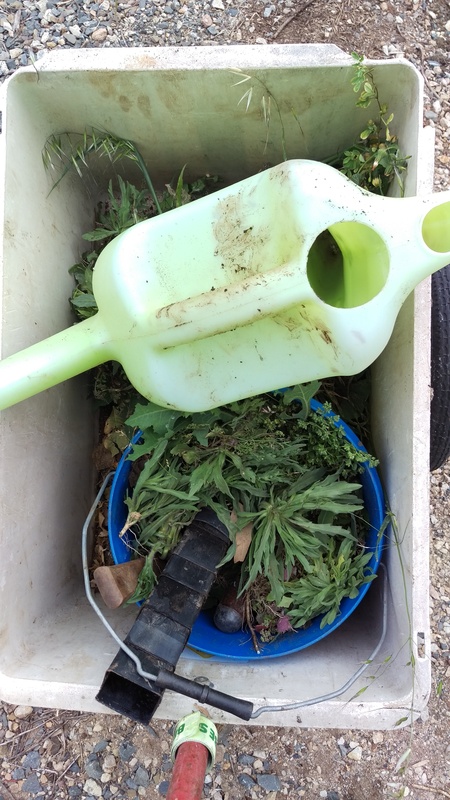 Weeds may be plants growing where they are unwanted but routine and repeated poisoning is not a great alternative. 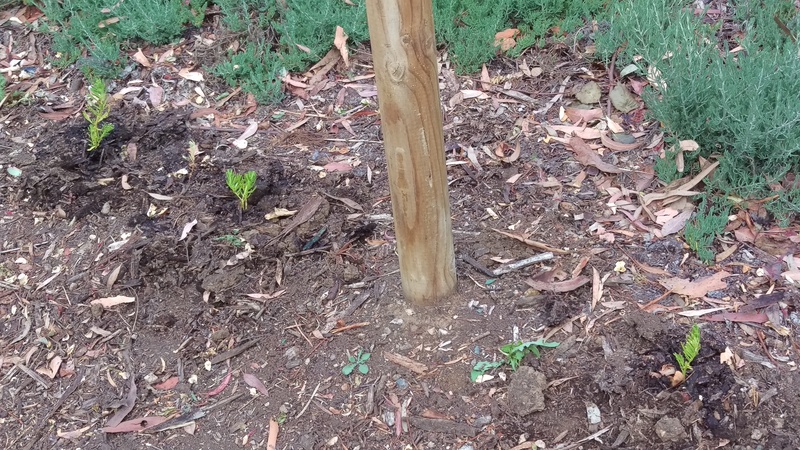 It’s one of the things I love about guerilla gardening, and thinking of it as caring for Kaurna land in some small way, that I understand more and more of the small ways of the place around me. Both its suffering under trash and poison and the way plants grow and spread and long to live and small creatures find ways to get by or thrive. The previous round of plantings have survived and begun to grow. 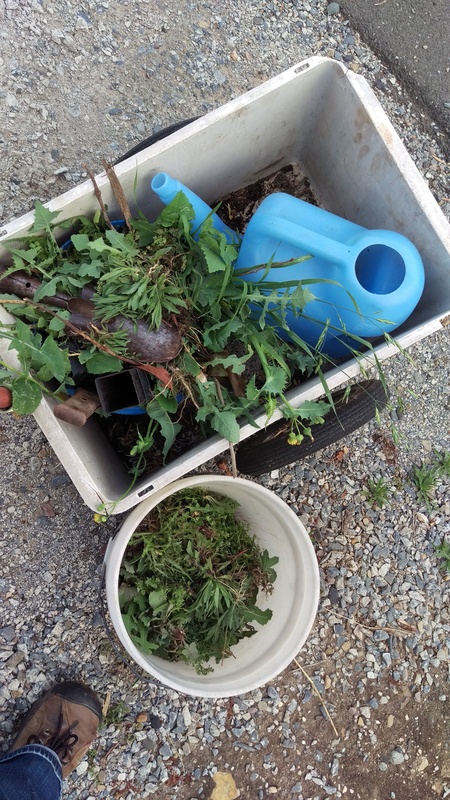 I weeded out the things I recognise to be weeds (less fumitory, more prickly lettuce and flax-leaf fleabane this time). I left the unnamed plant. 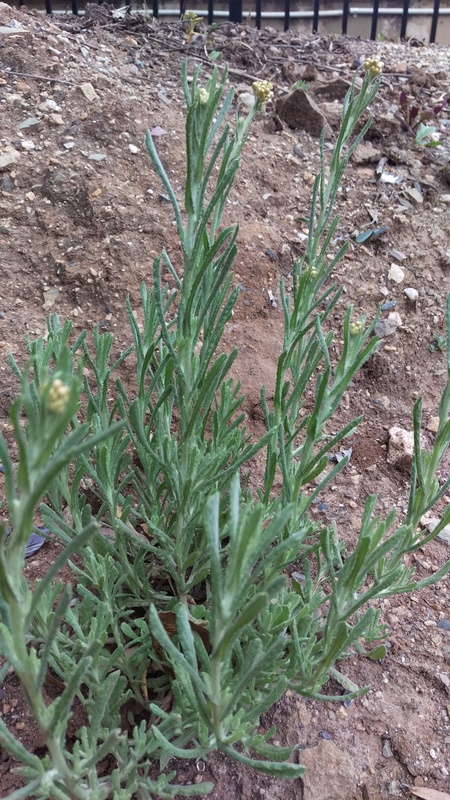 It may be native and is a handsome, hardy, silver leaved plant in any case. 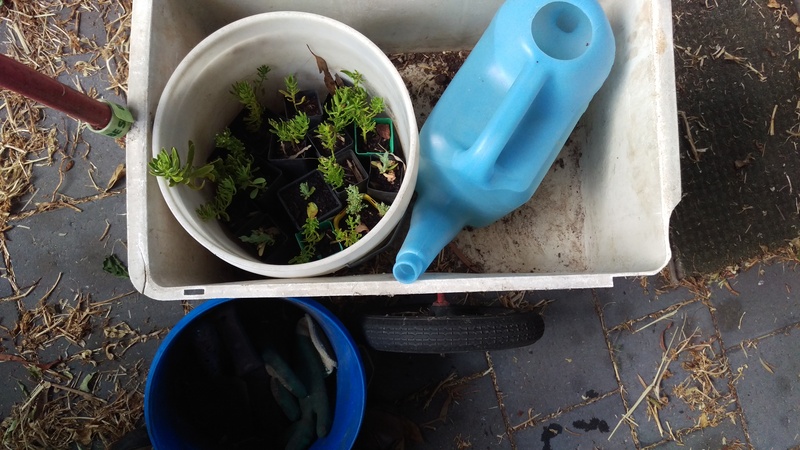 On the weekend I weeded on my way home from the train station and there was a broken bucket to pick up and use, into the bargain. 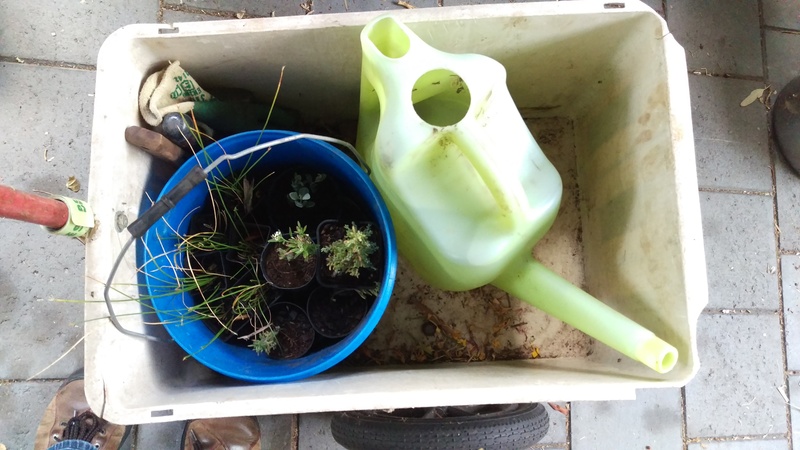 Chicken happiness, neighbourhood weeding, and trash turned into recycling, surely the trifecta of the guerilla weeder. 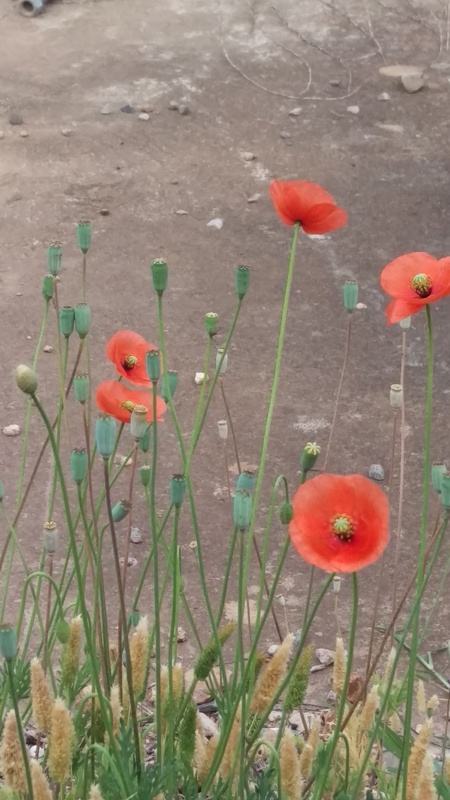 Then there were weedy poppies alongside the railway line. Beautiful. 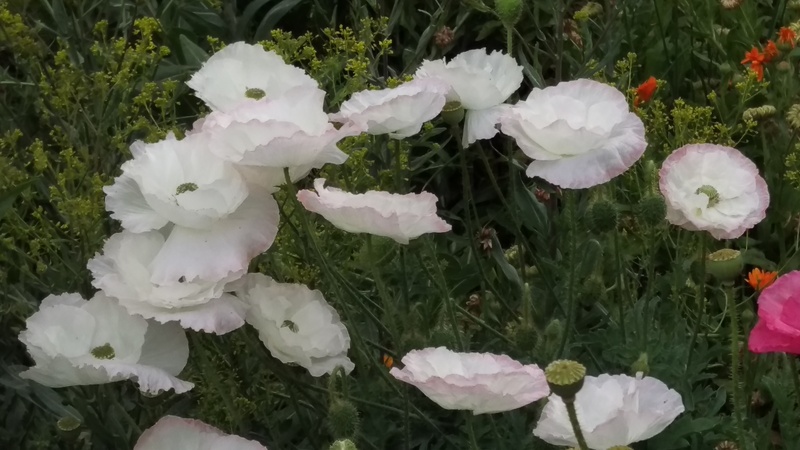 And shirley poppies at home in abundance. 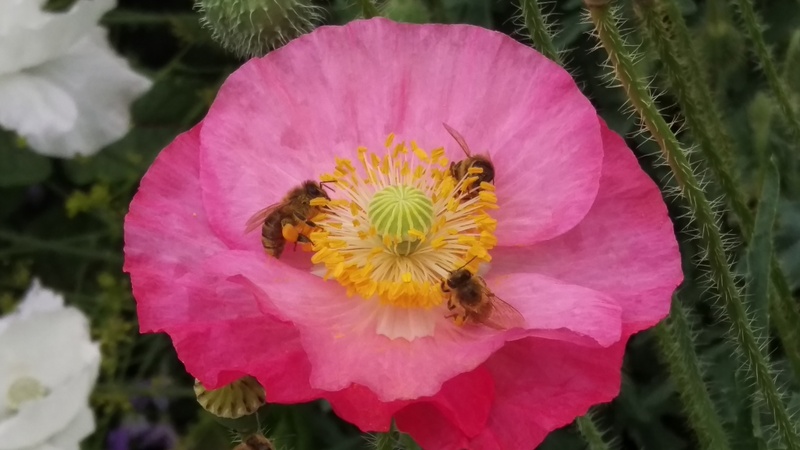 With bee revelry into the bargain. One landed on my thumbnail to inspect me. I am not allergic but even so it gave me a start, then I blew gently on it, and off it went. 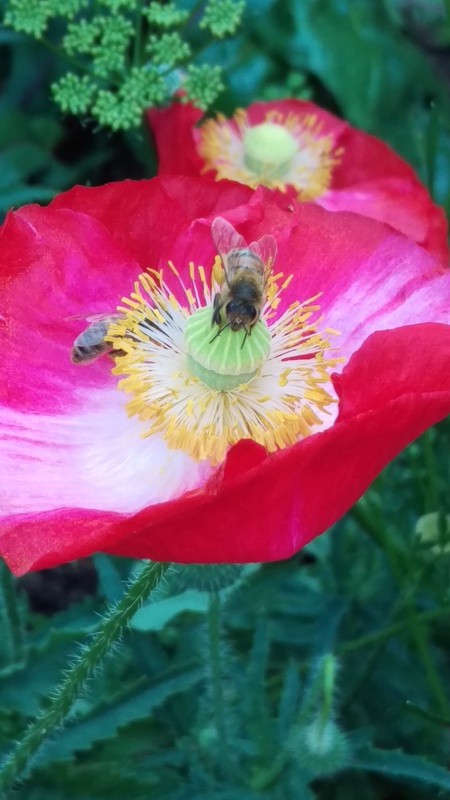 Blessed are the bees and those of us lucky enough to be able to appreciate them. 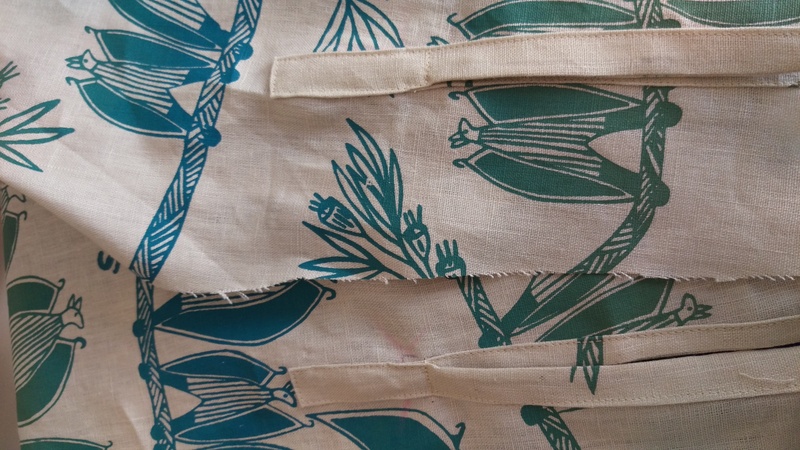 I bought some lovely screen printed fabric some time ago. I was taken by surprise at the hairdresser, a place I don’t usually have to resist the urge to purchase fabric. 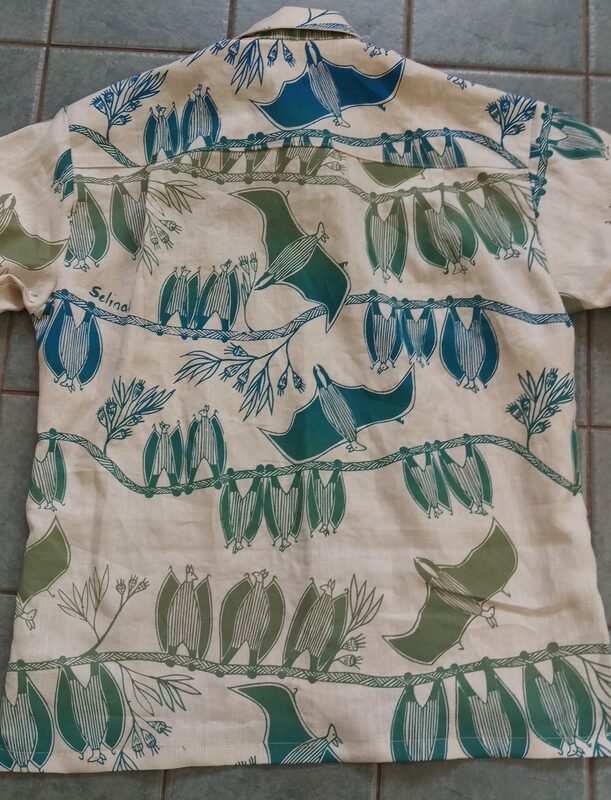 She had a lot of designs from Injalak Arts (from Oenpelli, Northern Territory) for sale and… I came away with this one: Kuluban (fruit bats) by Selina Nadjowh). 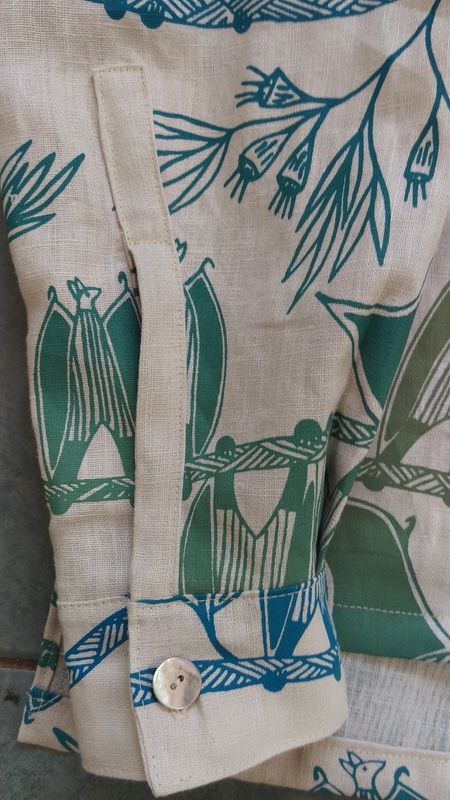 If you like it as much as I do, it turns out Injalak Arts are selling on Etsy. They are ‘a non-profit, community enterprise’ set up to benefit Indigenous artists. So do support them if you can. Here I am near the start, applying part of a stained, worn old tablecloth as interfacing. 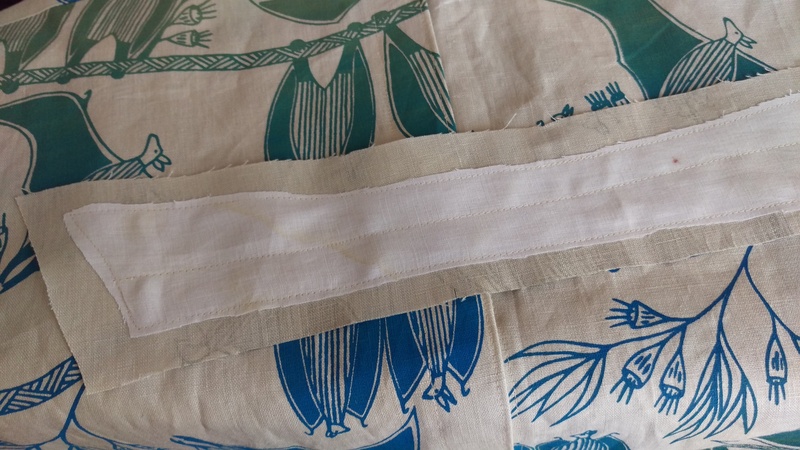 There was a bit of a placket crisis when I was intent on stitching the plackets one night and realised that I’d traced them from another pattern without instructions. Evidently I had also chosen a different sleeve construction (one with a placket in the main pattern section and not on the seam). 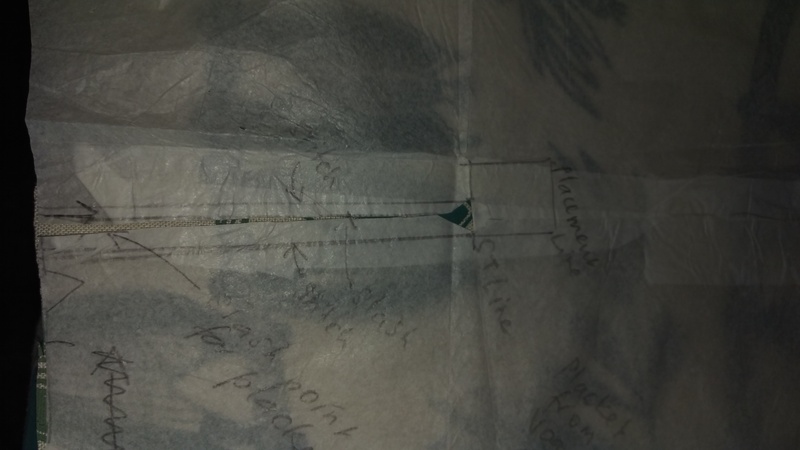 I had created a whole new pattern piece for the sleeve, which had a placement line and slash line. Not much help there…. I have made this pattern many times but it has been a while, apparently! I assumed I could fudge the plackets, which in the end, I did. Here they are in their quite-good-but-not-perfect-glory. The collar assembly in process. Recycled buttons came into it. I just can’t go past the pearly ones. I might have preferred smaller buttons, but actually these are good on such a bold print. 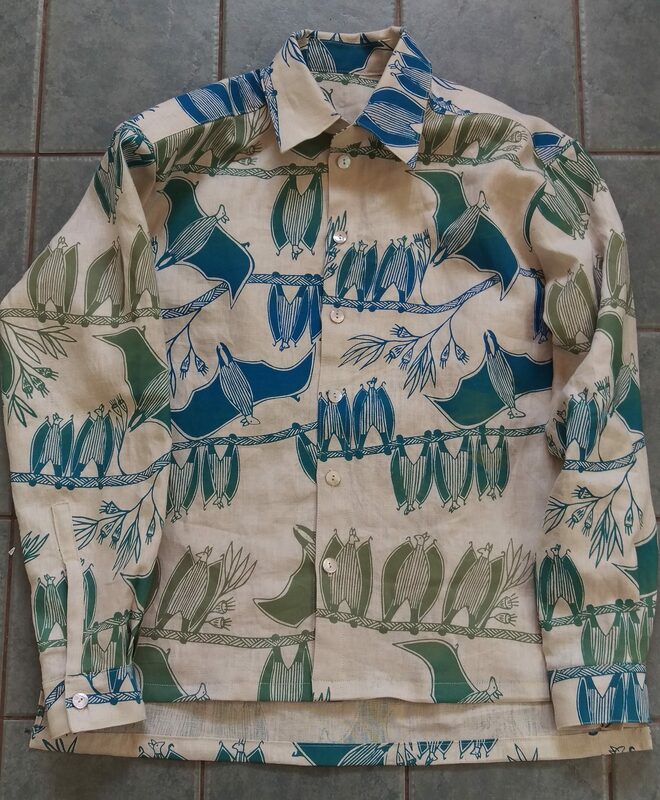 I chose the button side and the buttonhole side the way I thought looked best with the print. I’m not a big fan of buttoning up one way for boys and one way for girls, and I think I have shirts constructed both ways. When sewing a shirt I often choose depending on which front has least wonk factor. This time, not too much wonk at the front. The back, where you can see quite a bit more of the fabulous fabric. To be honest, my experience with shirts is that you can do anything you like if you have an awesome print. 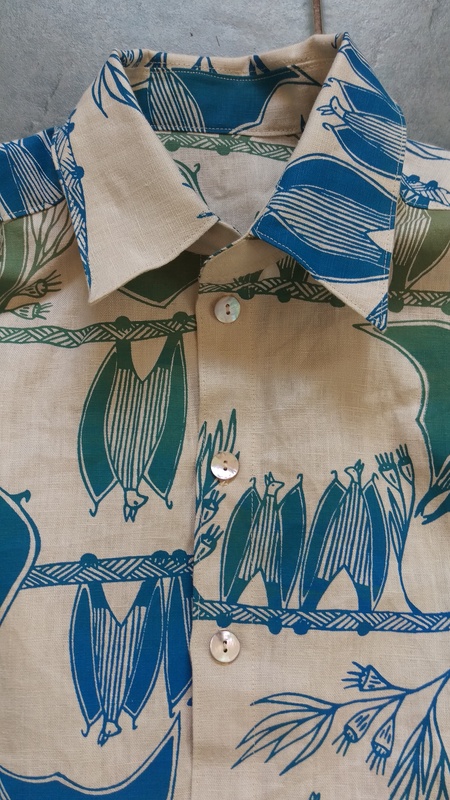 People don’t seem to notice how many of my shirts are from the same pattern, for instance (maybe they are just too polite to say)… and no one else cares about how I did with my plackets. And here’s the front! I think this shirt will be fun…. You might remember this street planting. The dianellas have grown a lot, but the grand plan of the person who envisioned this sweep of strappy leaves was disrupted when plant thieves, and/or people who had exciting alternative plans for dianellas, took 9 or 12 of them over several nights soon after they were planted. 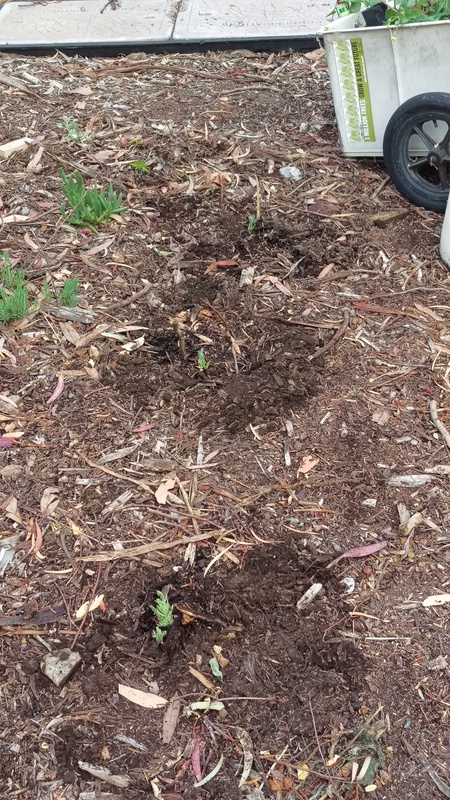 In the end I planted ruby saltbush to fill the gaps and keep the weeds down. But I felt for the person who pictured in their mind a thriving mass planting. In autumn I took divisions off the side of some of these thriving clumps, and almost all of them grew. 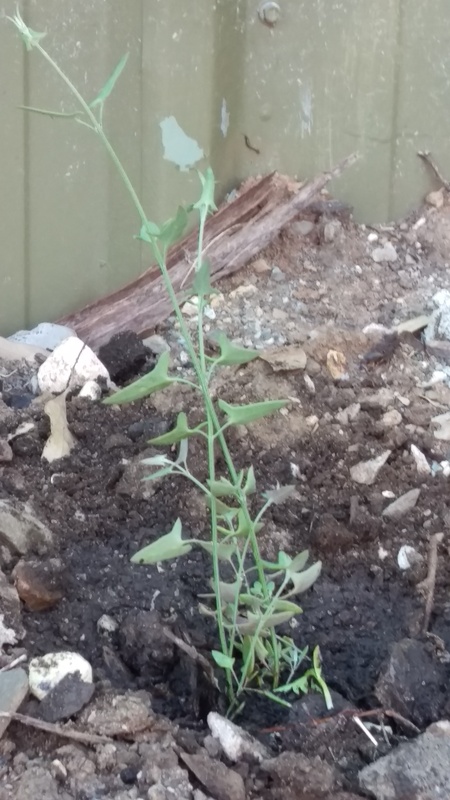 If they don’t, the seedling saltbush on the edge of the patch stand ready to spring into the space! Every time I looked at these seedlings as I passed them, this fabulous song celebrating the permaculture principle about making use of edges came to mind. See if you like it too. Not sure what I am talking about? Details on the permaculture principle here. Just in time for the rain!